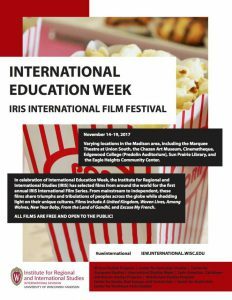 From Nov.14-19, in celebration of International Education week, the Institute for Regional and International Studies has selected films from around the world for the first annual IRIS International Film Series. From mainstream to independent, these films share triumphs and tribulations of peoples across the globe while shedding light on their unique cultures. Some of these films were even written or produced by, or feature, UW alumni, staff, faculty, and students. Don’t miss these films, curated by the IRIS area studies centers.